Unique coast links theme based on Greg Norman's Down Under homeland. The links style course is designed around scenic natural wetlands and features long carries, deep pot bunkers, tall grass-topped dunes, and large undulating greens. 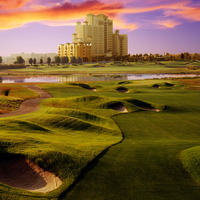 The International course has also hosted many of the top players in golf. A completely different experience based on a Florida Golf Resort theme. The lush Orlando golf course is weaves its way through the naturally rolling central Florida plains, and features mature Pine, Oak, and Cypress groves, spring fed lakes, bunker protected fairways and greens, and small, challenging putting surfaces. Champions Gate Golf Resort is also home to the world famous golf coach David Leadbetter and the David Leadbetter Golf Academy. David is most famous as Nick Faldo's golf coach during the peak of his career. Also at Champions Gate Golf Resort you will find a fully stocked Pro Shop and Piper's Grille restaurant and bar.